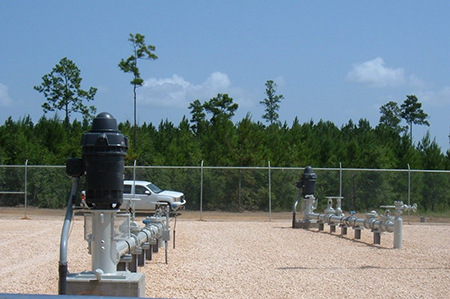 The first hydrogeologically sited wellfield in coastal Alabama was researched, planned, tested and permitted by O’Donnell & Associates, Inc.’s Dan O’Donnell in 1997 for an "on-island" Baldwin County irrigator. Since that time, OAI has gone on to develop another 12 wellfields for public, irrigation and industrial supply purposes. These wellfields consist of multi-aquifer and single aquifer wellfields with production ranging from 591 gallons per minute to 3,156 gpm (4.54 mgd), see Table 1 below. Wellfields don’t just happen. They require sound research, wellsite services, testing, evaluation, planning and implementation. With the operational life of Dan’s initial wellfield approaching 13 years and OAI’s proven track record with 27 completed wellfield wells capable of producing up to 32.5+8 million gallons of water per day, OAI is the company to call if you have a need for industrial, irrigation or public supply water. If you have a need to expand your water production capabilties, a wellfield may be to your benefit. Contact OAI today and learn more about the wellfield concept and how, if conditions are right, a wellfield may be the economical solution to your water supply needs. Below are some examples of the wellfields OAI has developed. A new 2010 industrial wellfield has been added to OAI's growing resume of wellfields, photo below. This new wellfield has a design capacity of 4.32 million gallons of water per day from two wells on 71 foot horizontal spacing. The producing aquifers, 150 feet apart vertically, have the potential to be further developed with additional wells. Project planning, drilling, testing and completion time for this wellfield was approximately 10 months. OAI is the leader in the research, planning, testing, designing, development and permitting wellfields of in the Gulf Coast area. This multi-aquifer wellfield developed for a Mobile County public water system, see photo below, taps hydraulically independent aquifers vertically separated by 150 feet of clay. The shallow well, left, is permitted for 600 gpm (0.86 million gallons per day) and the deeper well, right, is permitted for 850 gpm (1.22 million gallons per day). This multi-aquifer wellfield takes advantage of the "stacked" aquifers commonly found in the coastal plain. 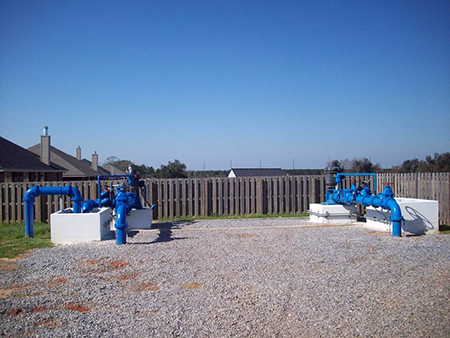 The two wells are located 41 feet apart on a single residential lot in a southwest Mobile County subdivision. The facility's treatment plant has the appearance of just another house in the subdivision. OAI's wellsite services, research, planning and testing ultimately led to the development of this wellfield with the potential to produce 2+ million gallons of water per day. 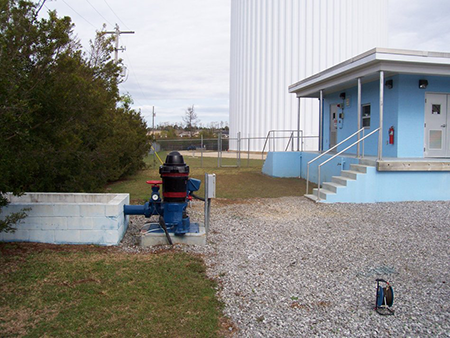 Wellfield #2 for this Baldwin County public water system, photo below, was completed in 2003. Site production increased from 750 gpm (1.08 million gallons per day) from Well #2, foreground, to 1,700 gpm (2.48 million gallons per day) with the addition of Well #9, background. The two wells, located 375 feet apart, are completed in the same aquifer. Groundwater level monitoring from 2004 to December 2008 show no indication the aquifer is being over produced. If you have a need to expand your water production, a wellfield may be to your benefit. Contact OAI today and learn more about the wellfield concept and how, if conditions are right, a wellfield may be the economical solution to your water needs.